A heart attack which is also known as myocardial infarction can be very dangerous if the timely aid is not given to the patient. Each second counts at the time of heart attack. 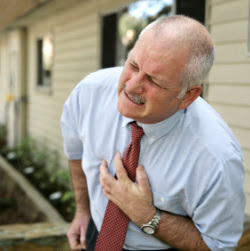 During heart attack there is sudden pain in the chest with breathing difficulty. The sever pain of heart attack can travel from cheat to neck, jaw and ear. A heart attack occurs when the blood supply to part of the heart muscles is severely reduced or stopped. The blood supply to heart is stopped or becomes slow if one or more of the coronary arteries supplying blood to the heart muscle is blocked In heart attack the patient becomes pale and grey. If the blood supply is cut off for more than a few minutes, muscle cells suffer permanent injury and die. This can kill or disable someone, depending on how much heart muscle is damaged. . Heart attacks can be suddenly fatal but the great majority of the attacks are not so fatal provided that the proper care should be given at that time. The heart patient must be reached to hospital as soon as possible. After a proper treatment, the heart patient can lead a normal life. As we grow up, the pumping capacity of the heart becomes weak. But the critical stage of heart attack results from the added stress of health conditions that either damage the heart or make it work too hard. The main reasons which lead to heart failure are high blood pressure, smoking, being overweight, eating foods high in fat and cholesterol, not performing exercises and having diabetes. Some people are born with structural heart defects which keep increasing with the course of time. The death of tissue from the lack of oxygen leads to heart failure. The heart needs a steady supply of blood. The lack of blood causes the pain or pressure in the chest. If the blood supply is not restored, heart cells can die and scar tissue can form, replacing working heart tissue. The heart strokes are caused due to obstacles in blood supply to the heart. The blockage of the arteries which supply oxygen to the heart causes the heart attack. 1. Don’t take greasy stuff if you don’t do hard physical labor. 2. Take regular exercise to make your heart strong. 3. If you feel any sever pain in chest which vanishes and returns, then you must consult a cardiologist.